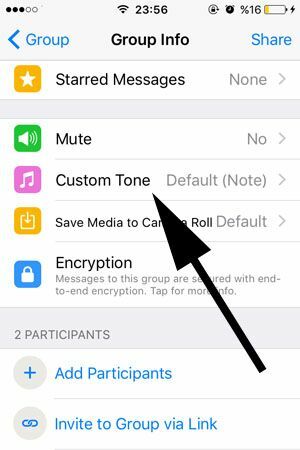 If you would like to change notification sound on your iPhone (or iPad) for a WhatsApp group, you will find a guideline with pictures on this page. We have already given many good information on WhatsApp Groups for iOS devices before. You can click here to check them all. If you have any questions related with WhatsApp groups or anything related with WhatsApp messenger, you can ask us through commenting this page or using Questions and Answers service of How to Chat Online. Let’s tell you how to change notification sounds. You can also mute notifications at all, if you don’t want to get any sounds nor notifying messages. 1-) Open your iPhone or iPad device and run WhatsApp Messenger. 2-) Open the group chat that you want to change notification sound. 3-) Tap on the group name as we have shown in the picture below. 4-) You will see a “Custom Tone” button on Group Info page of the application. You can see the location of the button at the picture below. 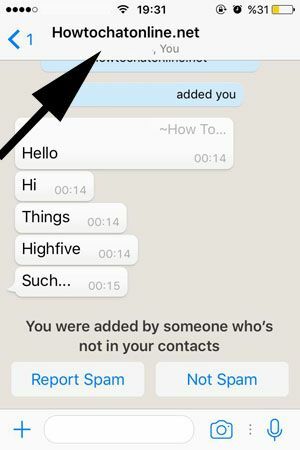 Tap on “Custom Tone” button to assign a new tone for your WhatsApp Group notifications. 5-) Sound list will appear on your screen, select one of those sounds and assign a new tone for your notifications. That’s all you have to do for changing sounds of notifications for WhatsApp group. We are going to provide similar information for Android devices soon. Keep watching us! You can also see our guide for notification alerts which is going to be very useful for you. Hello, welcome to How to Chat Online. Thank you for the comment and criticism. You should make your complaint to elsewhere about this though. The title of our content is quite clear. This is not already about a default tone though. It is about assigning a new tone to a specific WhatsApp group.